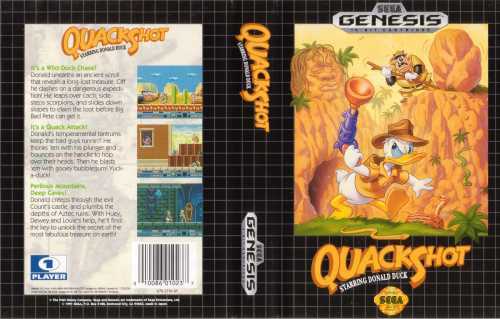 Have you been able to quack this game and find the Great Duck Treasure? No? Then try some of these ducky Game Genie (tm) codes. With Code 2 you never lose power. Vary the 3 Donald Ducks you normally start with by keying in Codes 7 thru 14. With Code 6, you're invulnerable to everything except the last boss's sword. Combine some of these, or use them one at a time, and you should be able to finally wipe out Big Pete! 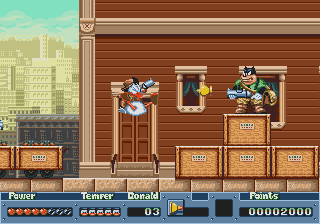 1 Unlimited Donalds - Here's how to rack up a tons of ducks in QuackShot. Grab the Bubble Gum Blaster in Duckburg, and enter Dracula's castle. Proceed until you reach the first stack of barrels. Blast the last barrel on the second row to reveal a 1-Up. Now leave the castle, return, and get the 1-Up again. Repeat this process as often as necessary, and refill your Bubble Bum Blaster ammo in Duckburg if you run out. Donald Duck from the stable of Disney cartoon stars. because of its great music and funny characters. The best thing here is of course the gameplay! is the only one I really like with this character. 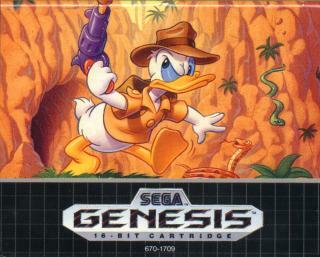 I don't like disney characters so much, I only have two genesis game related to disney, this game is one of the two disney game I have. The platform in the game, is also interesting, you need to handle some steps with tricks. Overall, the game play is very good and the graphics/sound up to standard, good job disney! Its funny and disney! See donald get Ducked off! its funny infact every donald game is fun! Donald explores the world, and also gets mad, angry, and weapon upgrades! I had this game a long time ago.. I gotta get it again, SOON! The popcorn gun is the best gun ever! I remember long hours standing at the Jukebox at Sears waiting for my parents to finish shopping playing this game!!! Down and resume game play. I think this is a great game. its nice and hard and the bosses aren't frustratingly hard just challenging.Also the weapons aren't half bad. 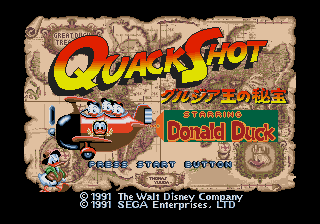 This game stars the duck with the potty-mouth. I have a cartoon in which Donald(a.k.a. Mr. Short-Fuse) was rumoured to have cussed while cleaning a clock. (He was rumoured to have said "F--- You! ", but he said "Says Who?!") I just love the way he blows his fuse! Donald would be perfect to become The Incredible Hulk for a duck. All he has to do is blow his fuse and get the super powers! 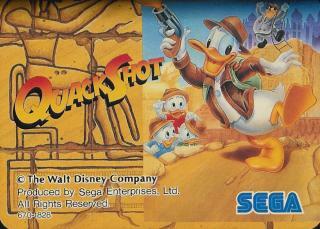 A realy playable disney game. Leyed to rest by most people when they hear the name disney, 'a kids game' they sey, they couldn't be further from the truth. an all-time SEGA great in it's own field.